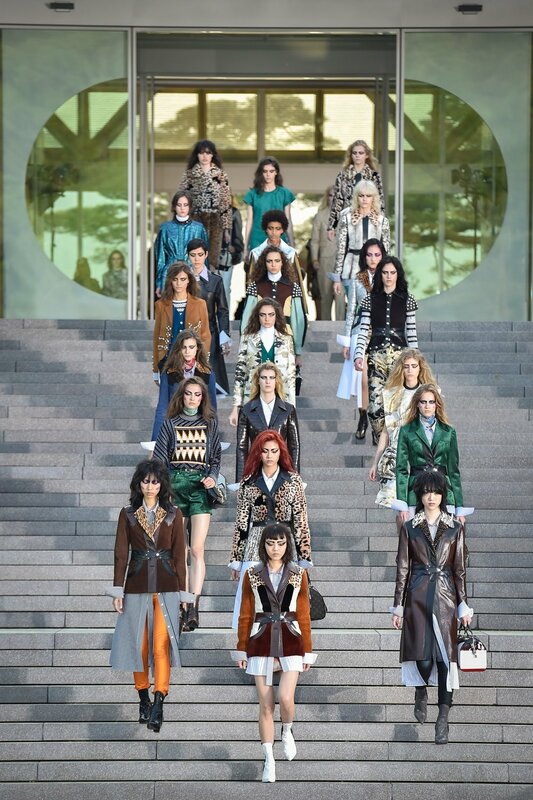 The Louis Vuitton Cruise Show 2018 took place at the Miho Museum, located outside of Kyoto in Japan this weekend. Previously the brand showcased the collection in locations like Rio, and in Palms Springs. The Miho Museum is a beautiful location designed by building designer I. M. Pei and is truly a sight to see. The fashion house’s designer, Nicolas Ghesquière, is a big fan of Japanese culture, which was showcased in the brand’s runway designs. For this collection Ghesquière collaborated with Japanese designer, Kansai Yamamoto. The Japanese designer is best known for dressing stars like David Bowie. The runway show featured Japanese references like kabuki with the models dramatic makeup with cat-eyes and signature brows. The collection higlighted lots of layered prints, sequined dresses, and of course our favorite the accessories. By the looks of this show, I am sure we will see our favorite celebrities and fashionistas rocking many pieces from the collection. We can’t wait to see how they style these looks. If you missed the show and would like to view the collection, check out the video below. Which look is your favorite? Be sure to let us know in the comments.